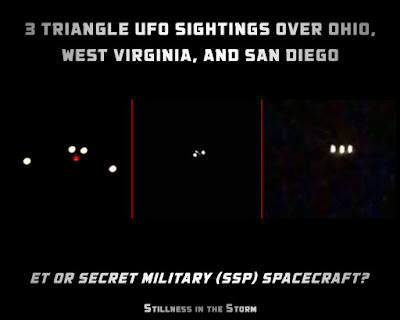 3 Triangle UFO Sightings Over Ohio, West Virginia, and San Diego -- ET or Secret Military (SSP) Spacecraft? 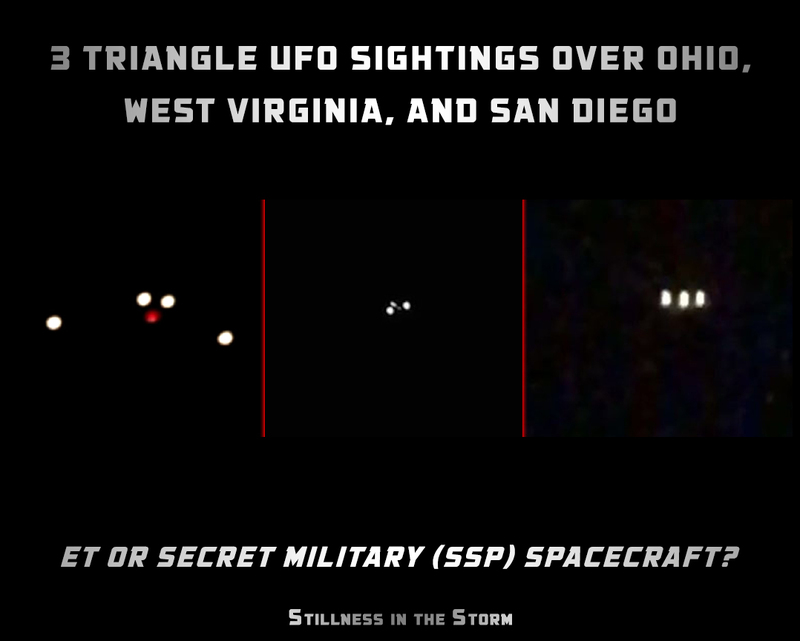 (Stillness in the Storm Editor) Triangular spacecraft have been associated with secret government projects, like the TR-3B. According to several whistleblowers connected to the military industrial complex and secret space programs, craft like this are employed by many different and sometimes unrelated projects—classified as deep black or Unacknowledged Special Access Programs. Related Corey Goode SBA Update | "Flying Dorito [Triangle] UFO Spotted Again" & "The U.S. Army's Top Secret Arctic City Under the Ice! "Camp Century" Restored Classified Film"
Some whistleblowers have said that those forces behind the military industrial complex (MIC) programs—which are part of the Secret Space Program at large—have been preparing humanity for a partial disclosure event. Part of this limited disclosure narrative involves the release of technology that—to the uninitiated public—would seem like full disclosure, involving the flyover of secret craft like what is seen below. Could these sightings be evidence of this limited disclosure effort by the MIC? Triangular shaped spacecraft are also a prominent feature in the cult classic TV series The X-Files, which is widely regarded as a hidden in plain sight disclosure through fiction operation. Others have said that the majority of objects seen in our skies are actually operated by human beings, likely connected to Secret Space Programs and what are termed breakaway civilizations. Thus, in our quest to discern what these objects are, we mustn't rule out the likely possibility that they are not extraterrestrial in origin. The object was massive in size from the witness perspective. The witness attempted to capture the object with a cell phone. The witness thought that the object might be a plane crashing. The witness included one image with the report, which was filed on December 4, 2016. Ohio MUFON Chief Investigator Ron McGlone is investigating. Please remember that most UFO sightings can be explained as something natural or man-made. The above quotes were edited for clarity. Please report UFO activity to MUFON.com. Here’s one interesting sighting of a triangular-shaped craft that was flying over Weirton in West Virginia. Witness report: Thank you for reviewing this case. I am also a MUFON member. Please do not dismiss due to the sound on this video, I will explain this odd event, I did not want to modify the video in any way to make it not credible. In September a week or 2 after coming back from Las Vegas Nevada my fiance and I experienced alot of bizarre events. During our trip to Las Vegas, being interested in the truth in EBE’s we drove out to Rachel Nevada, visiting the “black mailbox” I left behind an old student id card (not valid with an old address) after visiting the black mailbox we continued on our way to the back entrance of Area 51 and got as close to the gate as lawfully possible. As we walked to the gate jokingly I said to my fiance, little do they know that we know the truth. We then came back to WV and just a week or 2 after our trip. My fiance was on the back porch at night (approx time at top) she saw these very low triangular orb set glide across the sky, she then yelled for me to come out. I can describe the object or objects too low to be an airplane and absolutely silent to be a helicopter. Usually helicopters have red flashing or white flashing lights. This was just 3,4 or 5 solid white lights in complete silence. They orbs did not hang around too much and the video was a last second record, so its a bit shaky. The orbs slowly disapeared behind a wooded area, twords the end you may think the lights are flashing but its just the lights shining in and out of trees. *****NOW let me explain the sound*****, after we got done recording it I decided to upload it to facebook and after uploading it to facebook, because I like to educate the public best of my knowledge, for some odd reason, facebook added this most bizarre sound i’ve ever heard. Facebook cant integrate sound into videos you upload.. My fiance and I are very serious on this topic so neither of us would be so arrogant to crack a joke. To this day I still cannot figure out how the audio got added to it or why, to make it a bit more credible, i’m a Systems Engineer, I live, eat, breathe technology. Some unrelated bizarre happenings few days later after seeing this UFO, for 1 day and 1 day only, talking on the phone with my fiance, almost seemed like some staticy noise with odd sounds in the background, almost like two phone lines crossed over like the old cordless phones. We were using cellphones. It never happened again after that day… I feel like (not being paranoid) I was being profiled some how and some way by the ID I left back at the black mailbox.. If you have any questions please let me know, i’m happy to help disclose the truth to better mankind. Here’s a new footage of a bright lights in triangular formation that were silently hovering in the night sky above San Diego in California. This was filmed on 15th November 2016.